A player may use an alignment aid to practice their putting during a competitive round of golf. True or False? Now, I would be extremely surprised if more than 2% of you answered, ‘True’ to this question. I am confident that a very large majority of amateur golfers know that they are not permitted to use any kind of artificial device to assist them while they are playing a competitive round of golf. 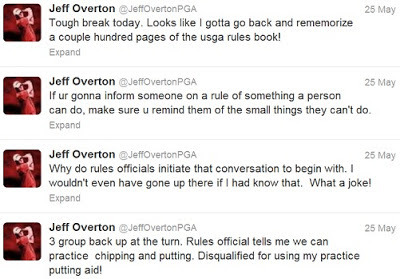 Surprisingly, US PGA Tour player, Jeff Overton, who represented US in the 2010 Ryder Cup, not only did not know this Rule but then blamed an official for not specifically telling him that he was not permitted to use an alignment aid while he was practice putting in the middle of his round! 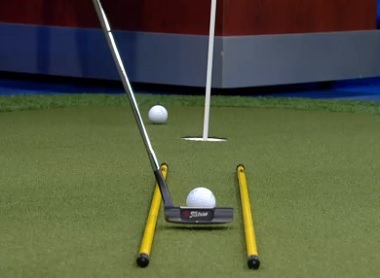 Where Overton went wrong is that he apparently placed an alignment aid on the practice putting green to assist him to line up his putts, presumably of a similar type to the rods in the photo above. This was reported to the Rules officials, not by a TV viewer this time, but apparently by a fellow competitor, though this has not been officially confirmed. Jeff Overton was aggrieved at his misfortune and like many before him made the questionable decision to use Twitter as the medium to vent his frustration (read from bottom up). 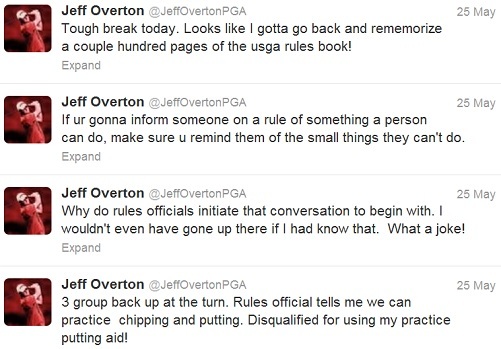 Jeff Overton is not new to golf. He turned Pro in 2005 and qualified for the PGA Tour the following year. He celebrates his 30th birthday today (29th May). Once again I arrive at the conclusion that players should spend more time obtaining a working knowledge of the rules of the game that provides their livelihood. They should also demand that their caddie does the same, so that they can properly fulfill their responsibility of assisting their primary source of income whenever there is a need. They could do worse than to start by subscribing to my free, weekly blog, by entering their email address at the top right of this home page, and my free ‘Rhodes Rules School’ weekly emails on the Rules at this link. Yes, a player may use a club to align their feet, providing it is removed before playing their stroke, Decision 8-2a/1. Temporary, non-permanent attachments to the shaft such as decals for identiﬁcation or tape to protect the shaft. Such attachments, for identiﬁcation only, may also be permitted on the clubhead (other than the face). However, these attachments must not be usable for any other purpose (e.g. alignment) or, in the case of driving clubs, must not serve to cause any confusion with the correct identiﬁcation of a club on the Conforming Driver List. Such attachments should, therefore, be subtle, plain in appearance and discreetly positioned" NOT BE USED FOR ALIGNMENT IT SAYS, but then it says "Attachments to the clubhead (other than the face), such as protective coverings, or decorative items or alignment aids, provided the item is semi-permanent, durable and not easily removable are permitted. However, such items must not excessively protrude from the clubhead and must conform to the shape of the clubhead. Also, for driving clubs, such attachments must not serve to cause any confusion with the correct identiﬁcation of a club on the Conforming Driver List. Permanent additions to a clubhead would be considered part of the head and, therefore, the head, in its modiﬁed state, would have to conform to Appendix II, 4 of the Rules (i.e. for dimensions and "plain in shape"). The rules also state that clubs can't have holes through them and yet adams have cut through slots in their clubs that do affect performance so how do they get away with this and fins are not allowed yet we now have the ping g30 club with them? You may mark the top edge of your clubs in the way that you describe. The long extract that you have copied refers to restrictions on the shaft of the club, not the clubhead. As you say, the Rules do not permit clubs to have holes in them. It is my understanding that the clubs that you refer to have cuts, slots or grooves in them and not holes.